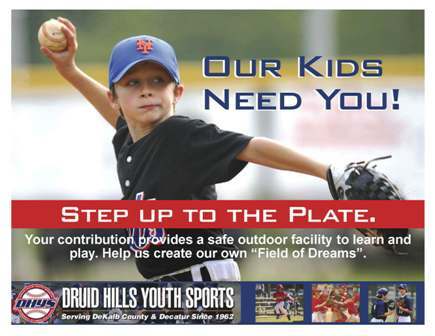 With more than 150,000 visitors each year, sponsorship of DHYS provides a great opportunity to help improve the baseball experience of each and every DHYS player AND gain exposure for your business among DHYS area families, friends, visiting teams and area residents who frequent the park year round! Our DHYS families come from numerous communities in and around Medlock Park (including Decatur, Oak Grove, Druid Hills, Emory, Morningside, Virginia-Highlands, Stone Mountain and others). Maintaining and improving our park facilities is a constant challenge. Sponsorships are what make critical improvements possible. It's a win-win scenario! Become a sponsor today and help us to improve and maintain the park, increase your business's visibility among area families and receive a tax deduction while supporting local youth baseball. Our four sponsorship opportunities include: Click the photo above for more info! All sponsors are invited to set up a promotions table at our Opening Day Ceremonies in the Spring. Corporate sponsorships are also available. Please contact Vin Tangpricha, .